Philip Kubicki worked for Fender before starting his own shop in Santa Barbara in 1973. He is the man who built George Harrison’s legendary rosewood Telecaster. 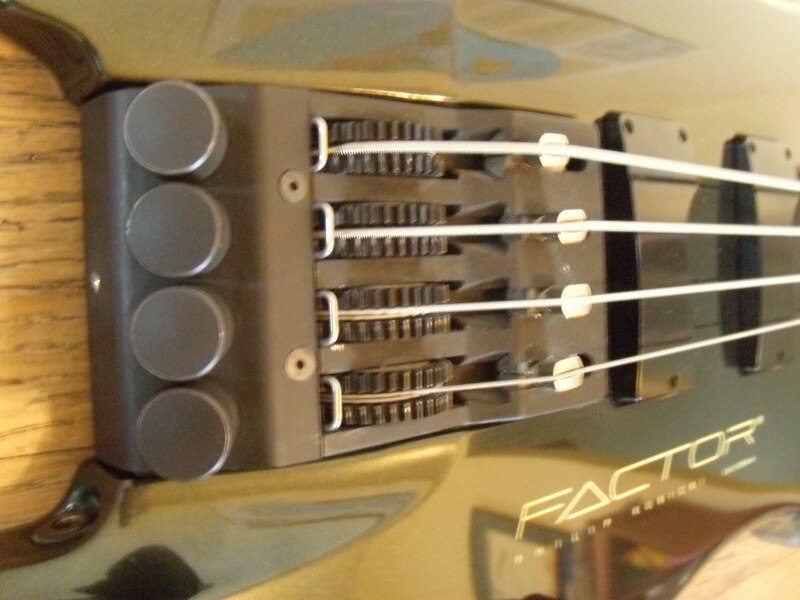 Factor bases are his brainchild, and are a lasting contribution to the evolution of the electric bass. Kubicki Factor basses were introduced in 1985, and were quickly adopted by John Taylor and Stu Hamm. The Factor basses were innovative, both in their appearance and their sound. Most obviously, these are headless basses. 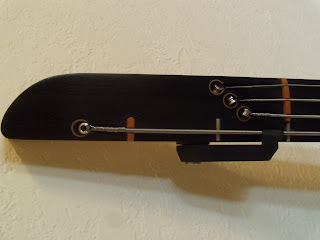 The bridge/tuner assembly is integrated into the end of the body, instead of being bolted to the top. The bridge is very different than the Steinberger system, in that the strings (normal strings, not double-ball strings) wrap around large drums, which provide a mechanical advantage so the tuning knobs are much easier to turn. Steinberger bridges use claws with narrow threads that are prone to wear due to the high stresses placed on them. I have never seen a worn-out Kubicki bridge. The bodies are ergonomically contoured, and are very nicely balanced. A nice touch is the location of the output jack, which is next to the bridge. This makes it difficult to accidentally pull it out, and the bass fits nicely in a stand without the cable hanging up. The necks are amazing, with a nut width that falls somewhere in between the Precision and Jazz bass profiles. They are crafted of 34 laminated pieces of maple with an ebony fretboard. I have yet to see one that warped or twisted. There is a conventional truss road that is accessed at the headstock, so you can adjust it while watching the relief. 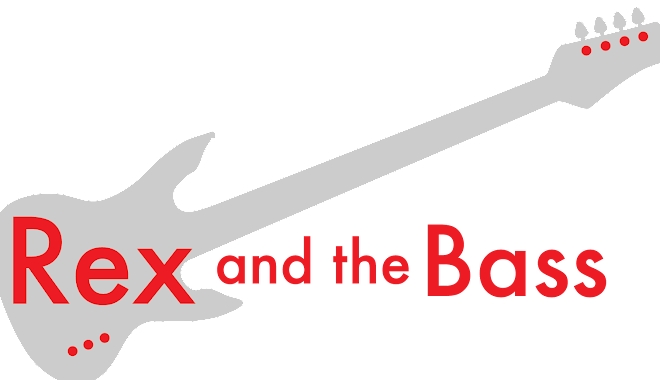 There are different necks for the standard Factor bass (34-inch scale, and the Ex-Factor, which has a 32-inch scale, and a clever detuner lever for a 36-inch scale E/D string. There are slotted fret markers on the sides of the neck, and these are the only thing I have ever seen consistently go wrong on these basses. On early basses, the filler for these expands, and becomes over-flush. Fortunately, it is an easy enough job to have them trimmed down to normal height again. Serial numbers are stamped on the back of the headstock, as well as the production date, shown as month and year. Example: 1238 01 89 = serial 1238, made in January of 1989. 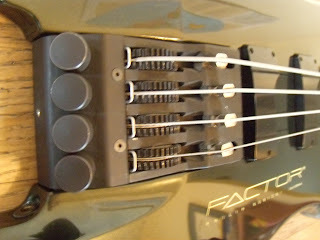 The original Factor basses have 18-volt active electronics, and all of the basses use two Kubicki-designed humbucker pickups. The controls are: two stacked pots (volume/pan, treble/bass boost), and a rotary selector switch with three passive, two active and one standby playing position. Used Factor basses sell for around $1000 to $1500 on eBay, depending on condition and year. From 1988 to 1991 Fender was licensed to build Factor basses. The serial numbers for these are from 1287 to 3850. The basses are essentially the same with the exception that many (but not all) came with 9-volt pre-amplifiers. There is also a Fender Custom Shop sticker under the clear coat on the back of the neck (under the clear coat). These generally sell for a little less money on the used market. If you love the sound of the electronics, but do not want to pay the higher freight to get a Factor bass (or if you just do not like the styling), you could opt for a Fender Jazz Plus. These sell for around $500 to $800 on the used market. They were produced the United States from 1989 to 1994 as both 4 and 5-string models. I have owned around a half-dozen Kubicki Factor basses over the years, and really like them. They are comfortable to play, and sound like nothing else on the market. The two active settings are simply thunderous, and there is no extra noise or hiss. Of course, you might not need this aggressive tone for all types of music, so it is nice to have the option of the three passive settings. Philip Kubicki has moved his operations from Santa Barbara to Colorado. He is still building the basses to order in many different configurations. Last year, I needed a little information about replacement parts for one of his basses, so I used the phone number provided on his web site. Philip answered the phone, and was very friendly, letting me know what thread pitch was used for one of the machine screws, and where to find one of the grabber-style strap hangers. A true gentleman, indeed. Rex, glad to know you still have this bass. A very nice in-depth review, by the way. I was very favorably impressed by the original X-Factor that we baby-sat for a while. I too found that the tonal settings were fairly tweakable for such an old preamp design. I think that amp and speaker choice affects this bass more than a lot of other similar active circuits. I just received an Ex Factor from the Fender era and I have to admit how impressed I am with the design of this instrument. The modern sound and style of this instrument along with the overall stability has me questioning the conventions of bass guitar and what it can offer. It is comprehensive in it's scope of what is possible not just as a slap bass but as a pluck, hammer-on, tap style of bass. It is not a discrete looking bass but it does define itself in style and sound with distinction. I know what you mean. The Factor is a very advanced design all these years later. Phil is a genius. It is a shame that others have not taken his lead and tried to do something with improving the ergonomics and tone of the instrument. Don't forget about the 1990's Precision Plus Deluxe as another Factor substitute! They have the same Jazz neck but a smaller body and of course the Kubicki preamp. The P+J setup actually sounds closer to Phil's humbuckers than the 2 J's in the Jazz do. Slapping for instance sounds more more like a Factor on the P bas plus deluxe for sure. Huh! I have to find a Precision Plus Deluxe to try out. Thanks for the tip! Thank you for the nice review. The comment about the side dashes expanding was during the Fender licencing period. rex. good pm.. i just want to ask; i have a philip kubicki factor bass. but instead of the name FACTOR, whats written is BLASTER.. do you have any insights about that? hope you can help me, its bothers me alot..
thanks man.. so is blaster basses form philip kubicki? I saw a blaster bass kubicki japan on ebay, and I interested in buy this, but I cant find a video sound sample..do you have one at youtube? Hello. They were overseas copies that were licensed by Kubicki, but he did not build them. made by Phil in 2009. One i Spalted Maple and the other in Honduras Mahogany. Both of them with 18v circuits ! i am desperately looking for a pre/post fender ex factor as they are virtually impossible to get where i come from. if any one has one in really good condition pls email adriandmello1974@gmail.com. ive even tried Phil himself. ufortunately he is overworked with back order to consider building a bass for me anytime soon. so i just have to wait. I had my first hands-on encounter with Kubicki at a store in Ottawa in the early 90s; I fell hard. But couldn't afford it. Then a few years later, Songbird in toronto had one for a ridiculously low price. Apparently it had sold and come back twice, the (loser) buyers couldn't figure out how to get it up to pitch. Their loss was my gain. She is my best girl. I have never played an instrument as well crafted. You cannot get a bad sound out of it, and it plays itself in my hands. Thanks PK. Did someone say (long ago) the shop moved to Colorado? I have an ExFactor 477-12-84. Hello. His shop moved to Colorado, but Phil passed away earlier this year, and I do not know if the business will continue. Sadly we lost of a visionary and genius :( A year on, has anyone picked up the business? I see the Kubicki site is still up and running so I guess it's continuing all be it on a small scale now. Hey Rex, do you still own a Kubicki ? Sadowsky NYC Original P Bass Guitar.